WASHINGTON — The European Union (EU) has decided to blacklist Hezbollah’s “military wing” as a terrorist network, especially after recent developments in Lebanon. Reuters reports that the European Union’s most recent move does not change things regarding Hezbollah activity within EU jurisdiction. This partial ban leaves Hezbollah’s political activities untouched, which means that this action is largely symbolic. 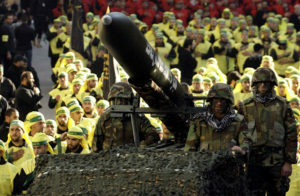 Hezbollah has its own standing military force, which is funded by Iran and is current embroiled in the Syrian civil war. Syrian President Bashar al-Assad has seen some gains after Hezbollah soldiers helped his beleaguered forces in several hotspots in his country. EU members said that this was a move to distinguish the military from the political arm, but as the Iranian Interior Minister Ali Akbar Salehi said, this action was “toothless”. If political ties were severed, it would mean that Lebanon would no longer have open channels with Europe and could further destabilize the country. Hezbollah killed at least one protester after it officially entered the Syrian civil war and whose casualties are largely unknown at this point in time.